Milan, May 30, 2012 - From May 25 to 27 was held the famous Concours d'Elegance Villa D'Este in 2012 , which rewards the most beautiful cars of all time, divided into categories. The popular initiative began in 1929, but only since 2011 coninvolge also motorcycles, with the same rules as cars. On the shores of Lake Como, taking advantage of the spectacular setting of the park of Villa Erba , then ended the second edition of the coveted dedicated to motorcycles from museums and private collections that have, for various reasons, left an indelible mark in the history of motorcycle racing. Appointment in 2012 was attended by 35 motorcycles , as well as a special selection of prototypes, all of them submitted to a jury that it is possible to define absolute for levels of expertise and knowledge. In a scenario prestigious and selective (for some collectors simply because they have been selected for the exhibition is seen as a victory), the first and most coveted prize of the jury, or the "Best of Show" was awarded to Gilera Rondine , the wonderful motorcycle racing in 1939, from the Museo Piaggio, a work of engineering art can revolutionize the racing world just before the Second World War. 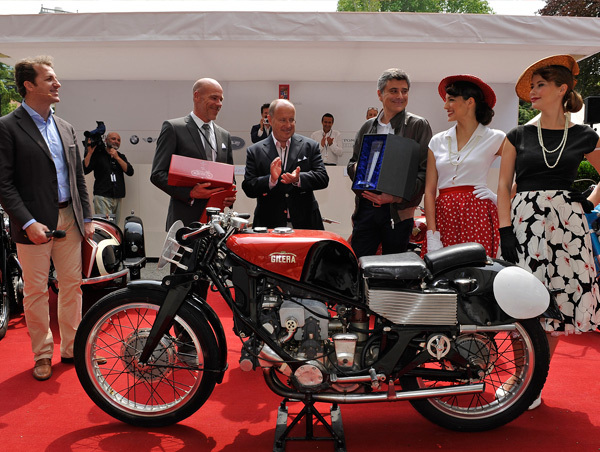 The uniqueness of the Gilera Rondine is represented by its engine, rightly regarded as the forerunner of the modern porpulsori plurifrazionati frontemarcia . A project at the time so revolutionary and futuristic to inspire the next massive production of four-cylinder engines in the Japanese line. It is a quadriclindrico of 500 cc with distribution in dual overhead cam, four gears, equipped with technical refinements as the supercharger, the connecting rods and the crankshaft mounted on roller bearings and cylinders tilted forward 30 °. The maximum light comes the incredible figure of 90 hp at 9,000 rpm / min, a performance that allowed the Swallow to win laurels to repeat most of the circuit where he raced and beat the speed record in 1939 to over 274 km / h , with a special version with a full fairing studied in the wind tunnel. The award, retired from Marco Lambri, director of the Centro Stile of the Piaggio Group, will then enrich the enviable track record, this exceptional model. A Villa Erba were many other extraordinary motorcycles. In fact, in 2012 the event has been organized numerous exhibitions, and over a seminar on motorcycle design, with models and prototypes created by famous designers and famous manufacturers. For the first time in an exhibition was also Vespa 98, the very first Vespa prototype has always jealously guarded in the Museo Piaggio, the founder of the most famous scooter in the world, sold in over 17 million units worldwide from 1946 to the present. Exclusive as the participation of the first Moto Guzzi built in series from 1921 to 1924, powered by a single cylinder with two valves opposite distribution.